Kolkata, April 16: Virat Kohli is still learning as a captain, feels former Australia batsman Simon Katich ahead of his team Kolkata Knight Riders' clash with the Royal Challengers Bangalore at the Eden Gardens here on Friday. RCB and India skipper Kohli has cut a forlorn figure more often than not in the Indian Premier League (IPL) this season as his team slumped to one defeat after the other, currently finding themselves rooted to the bottom of the table with seven losses from eight outings. On Monday night, they lost to Mumbai Indians by five wickets. Arguably one of the best batsman to have ever played the game, Kohli has failed to inspire his bunch and Katich, who is the assistant coach of KKR, feels the 30-year old still needs to develop as a leader. "I don't know how he operates within the group. He is probably still learning as a captain as well," Katich told IANS in an interview. "You can be a great player as he is, leadership is something that can be developed over a long period of time. So he is still in a phase where he is learning a lot about himself as a leader," said the 43-year old former Test opener. Forget Virat Kohli-RCB Funny Memes, Angry MS Dhoni Jokes Are the New Favourite of IPL 2019 Season. Kohli will lead the Indian team to the World Cup in a little more than a month's time in England and Wales. Katich said while Kohli the batsman cannot be faulted, MS Dhoni's guidance will be the key at the mega event starting May 30. "He has got everything covered as a player, he is going to go down as one of the all time greats. There is no doubt about that. As a leader, he has got attributes like passion and energy he brings to the team, India and RCB. He wants to win and has got a strong desire to succeed which is what you need as a captain. 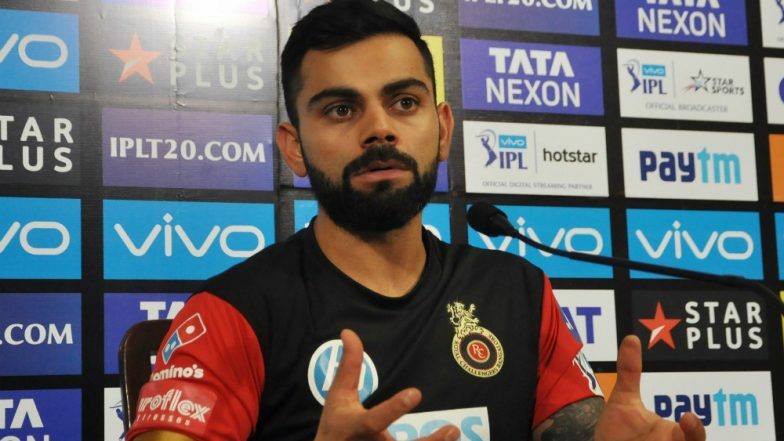 Virat Kohli’s Doppelganger Found After Funny RCB Meme Goes Viral Following Royal Challengers Bangalore’s Winless Campaign in IPL 2019. KKR will take on RCB looking for a win badly to snap their three-game losing streak. Asked about RCB's travails, Katich opined the team may have not been able to gel together as a unit and don't seem clear in the way they want to play despite having star players in their arsenal. "You look at some of the players they have had, I guess you got to ask the question, are they clear in the way they want to play? Because in terms of what they have at their disposal, they haven't been able to gel as a unit. "That's something only the coaches and captain can answer. We can only answer from our position and from an opposition point of view, we try to exploit their weaknesses. And if there is over reliance on any players, you try to exploit that by putting pressure on them." Katich also backed KKR skipper Dinesh Karthik to bat at No.4 for India in the World Cup after the stumper-batsman trumped Dhoni's heir-apparent Rishabh Pant to the 15-member squad announced on Monday. "There is lot of talk around that No.4 spot, and he is a guy who likes to spend time in the middle. Once he is set, he is very hard to bowl to at the back end. He has got all the tricks and he does have the timing and power to clear the rope," Katich said. Karthik hasn't been among runs so far in the IPL, batting at No.5 or No.6. Katich believes it is down to the lack of opportunities that the 33-year old has got.